Last day in Tokyo, a busy one! My last day’s itinerary for Tokyo would be Senso-ji Temple, Denboin Gardens, Nezu Shrine, Meiji Shrine, Shibuya and Shibuya crossing. Yes, yesterday’s hiccup with the overcharge took up most of the day. Even so, it didn’t deter my enjoyment of my short saunter in Tokyo (Tokyo Part 2). PS. After more emails, there was still no resolution grrrrr! After a quick breakfast, I needed a caffeine boost to help kickstart the day. The day before I had found a great coffee shop around the corner from the hotel. I realised the following day it’s actually a hostel…a hostel which happens to have a great coffee shop. Cool place, with an industrial décor, and military precision-made coffee. What really impressed me was their meticulous approach to making the coffee; they weigh the ground coffee to ensure the precise amount is used to achieve consistency for every cup. One of the best cups of coffee I’ve ever had. If you ever happen to be in the area its worth visiting Berth Coffee, I’d even make a short detour. My day commenced fuelled by rocket strength caffeine, I was moving with gusto and purpose! 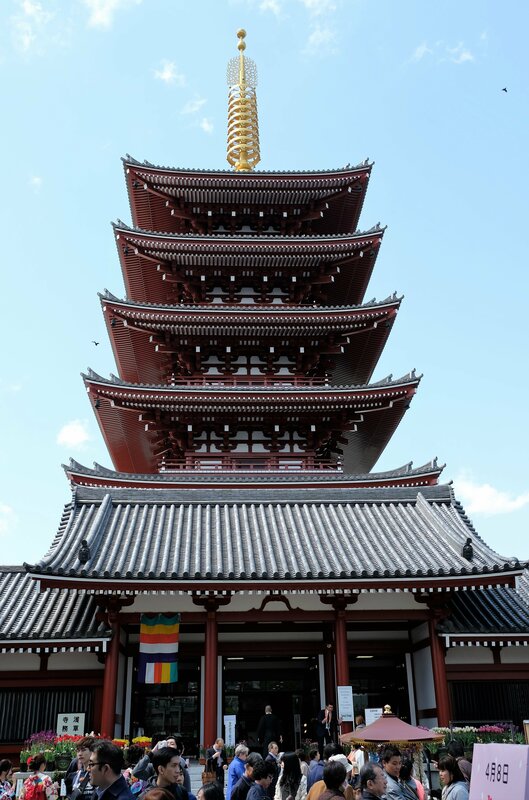 First, the Buddhist temple Senso-ji, the oldest in Tokyo. To me, temples/shrines conjure up thoughts of zen like places. A place of meditation, reflection or simply a place for peace and quiet to escape the world. Not so here…I’ve been to music festivals with less people! Senso-ji is at the end of a circa. 100m walkway, shouldered with shops on either side. These shops aren’t a recent construction for tourists, they were specifically constructed as shops early in the 18th century. Selling arts, crafts and temple related goodies along with sunglasses and tacky stuff…anything really. If you like trinkets this place is your jackpot, but you need to wade through a sea of people. It may be better if you visit very early or late, that would be my recommendation. Consequently, even the most stunning of places can lose their sheen when packed full of people. It’s the same throughout the world, pity. Senso-ji became an independent temple not long after World War II, prior to this its association was with Tendai of Buddhism. 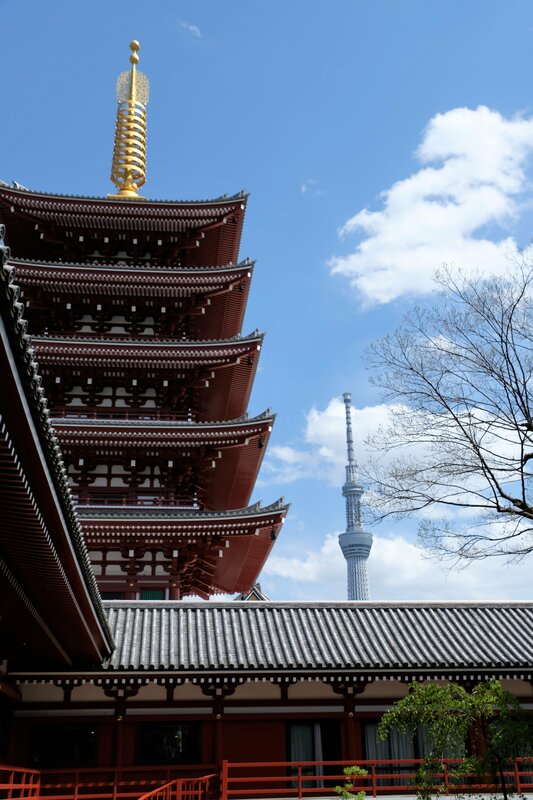 In fact, temple Sensoji Kannon main temple (Bodhisattva of compassion), is said to be the most visited spiritual site in the world – 30 million people per year! Hmmmmm…explains why it was so busy, wish I knew that before visiting. With the first temple constructed in 645 AD, it followed a prior shrine dedicated to Kannon dating back to 628. 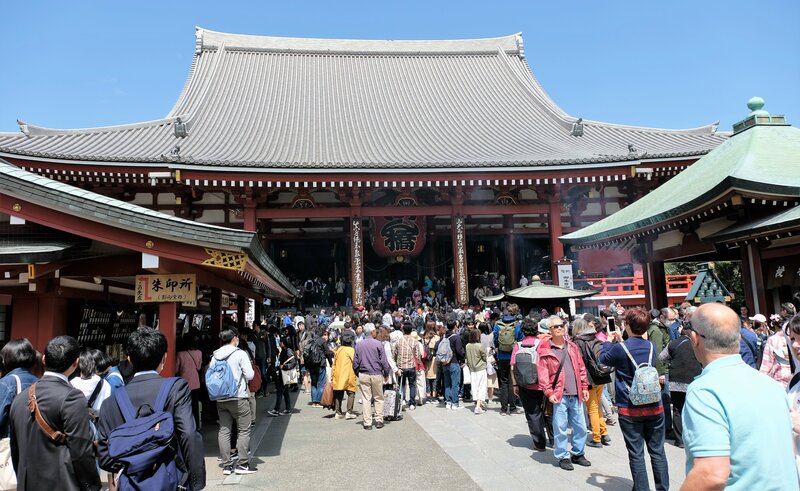 Included in the grounds is Sensoji Kannon, a five-story pagoda, Shinto shrine and the Asakusa Shrine – that’s not all it has, with 10 temple/shrines in total. Can’t say much else about the main area, I got to frustrated navigating through the people….so I didn’t. 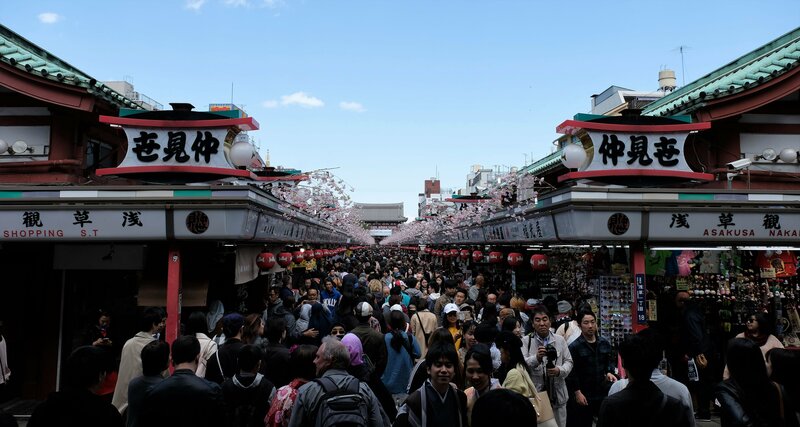 Moving on, I can’t say the visit to Senso-ji Temple was enjoyable, the noise and congestion irritated me. As a result I found myself taking photos for the sake of doing so – I hate that. I lost my ticket to Denboin Garden sometime during my travels, it wasn’t expensive that’s all I do remember. Funny, even though it’s not a temple the environment is akin to one. 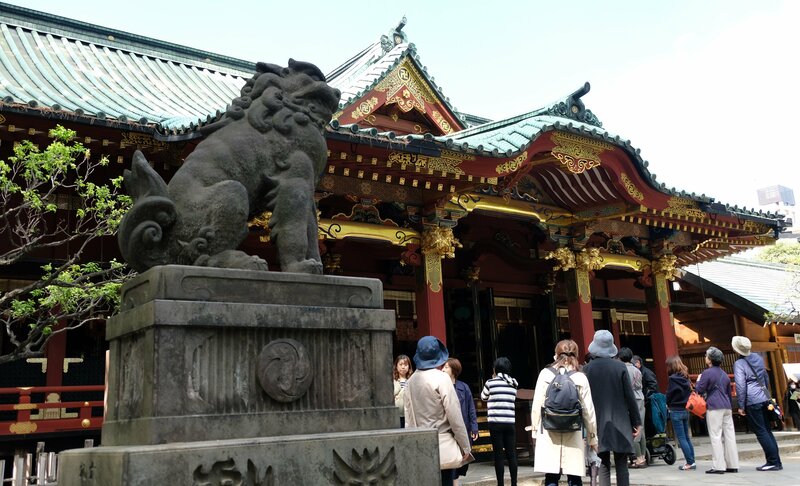 Denboin Garden is adjacent to the Senso-Ji complex, an inconspicuous entrance hidden away. Looking for relief from the crowds I found it by mistake (glad I did). My timing was perfect (lucky), because it’s only open to the public between mid-March till early-May 😊. Keeping on the topic but going off on a tangent. Without a doubt Japanese gardens are the most beautiful I have ever seen. 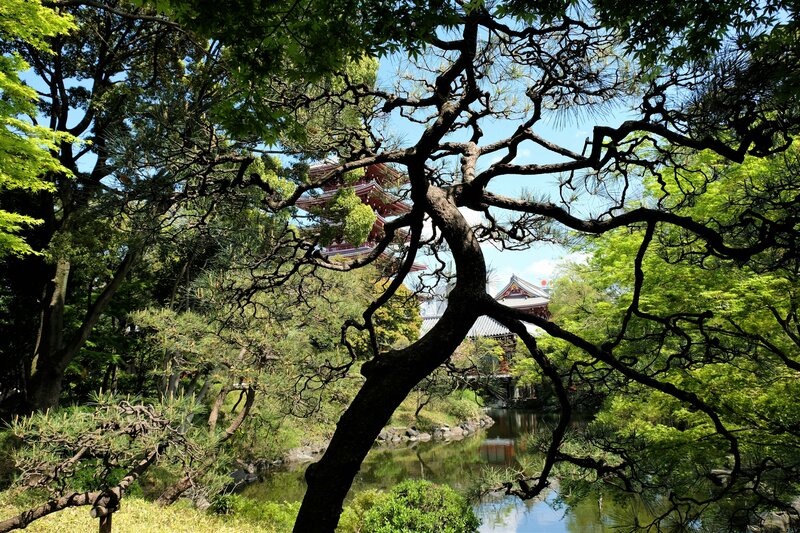 Tokyo gardens and parks are stunning, but pale in comparison to what I would see in Kyoto. Gardens are manicured down to the blades of grass (that’s no metaphor, I saw this in Kyoto). Still, with such pride and skill put into these pristine gardens they somehow manage to feel natural. For this reason, some gardeners are revered in the same light as artists, Denboin Garden is a great example of this. Denboin Garden is attributed to Kobori Enshu (1579 – 1647); an artist, celebrated garden designer and master of the tea ceremony. A large pond filled with koi is the focal point of the garden, with a walk path around it. Like taking a walk around a lake set in a little forest. Within the grounds is one of the original lodgings where the monks working at the Senso-ji temple used to lived – you can see it but no entry. It was great to get away from the hordes of people, but my time was limited, I had to a schedule to keep. Nezu Shrine would be my next stop of the day. 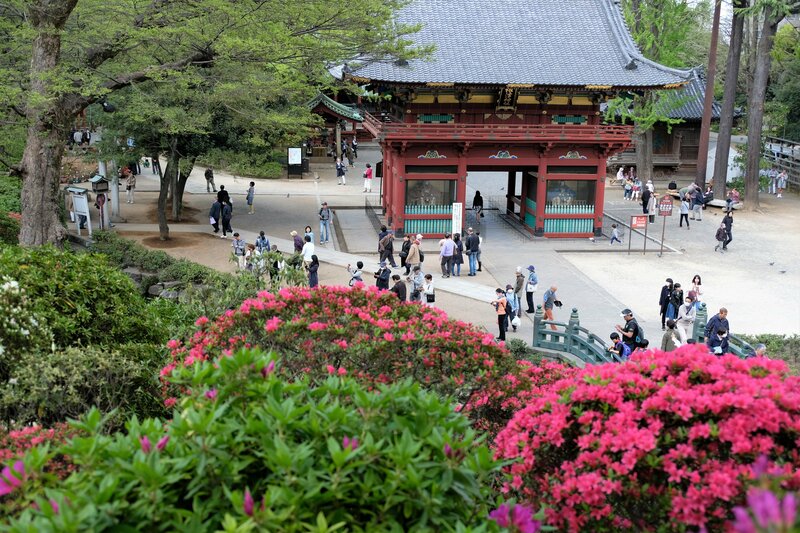 Visiting Nezu Shrine is secondary if you go in early April to early May, why, because the Azalea Festival is on. WOW! My brief time in Tokyo was a Yin Yang metaphor. 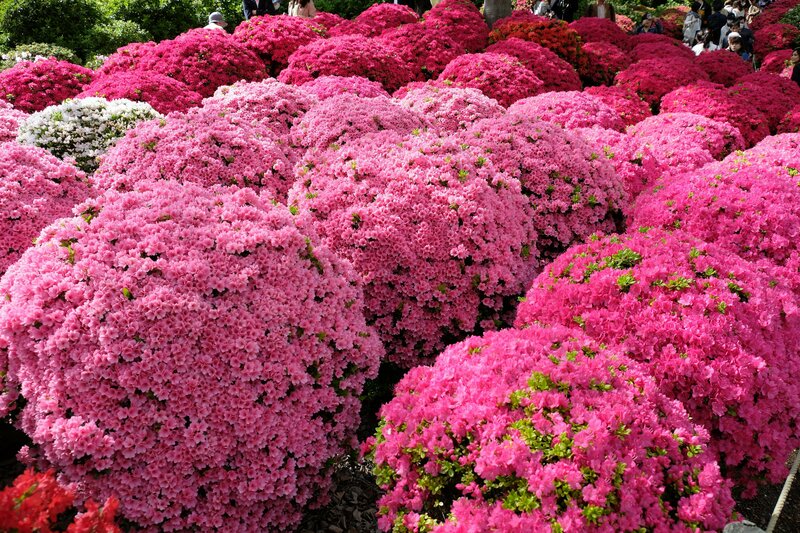 Not knowing the Azalea Festival was on, because I didn’t know it existed. Completely distracted by the vivid lush display of the garden, paying little to no attention to the Nezu Shrine. Before I get into the Nezu Shrine (and garden! ), I regret not taking more pictures on the walk from the station. Particularly when walking passed traditional Japanese restaurants well-known for Fugu; Japanese word for the dish prepared with puffer fish. Many chefs and staff in traditional dress standing outside, all stern looking. My guess was it must have been their breaktime. Sadly, I did not see this sort of thing again, hence my regret not taking photos. For this reason, don’t be shy to take pictures if something catches your eye! Another lesson I learnt the hard way. 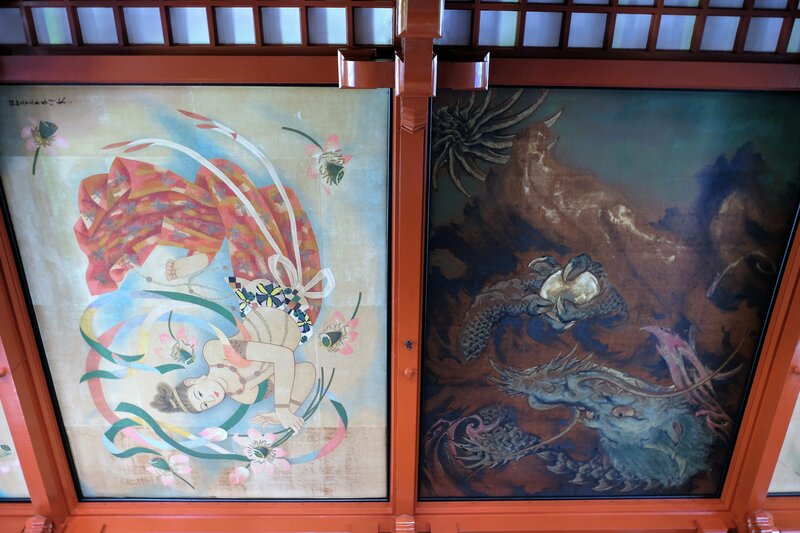 Background information; building the Nezu Shrine began in the beginning of the 18th century in Ishi-no-ma-zukuri style of Shinto architecture. Considered of great cultural importance, it is old, famous along with being one of the oldest places of worship in Tokyo. It is most well-known for its gardens…I’ll get to that very shortly. At first it was located further North, “that” shrine was founded in the 1st century. 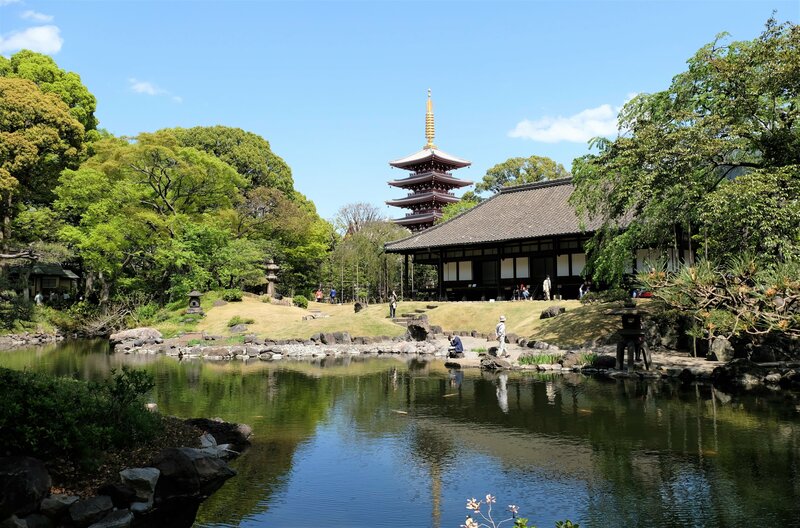 It was moved in 1705 to the current location by Tokugawa Tsunayoshi (1646–1709), by the fifth shōgun of the Tokugawa dynasty. Yes, these are vague and basic descriptions – I’ll add more details about these are I post about my time in Japan – no, I won’t forget. My first bit of detail is about the torri. I guess most people have seen these tunnel-like structures when looking at pictures of Japan, I certainly had. Here would be my first opportunity to see them up close. Their visual impact intrigues and lures you further down the rabbit hole as you walk through/under them; following the lay of the land, like a snake laterally undulating its way through the garden. Torii come in various sizes, some are huge! Not all are red/orange (vermillion to be precise) either. Maybe it’s just my experience, or bad memory, but I cannot recall any small/short torii that weren’t vermillion. At the entrance of some shrines/temples torii can me stories high, then usually make of massive timber &/or concrete. The larger are normally singular structures, the shorter/smaller, as is the case at the Nezu Shrine are in multiples. 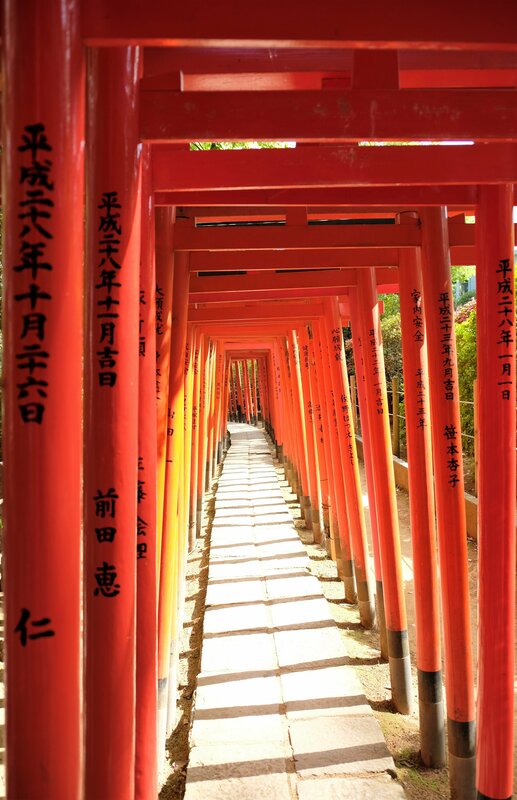 During my time is Kyoto I would see torii of a different kind, laid out in their thousands! I’m not going to make stuff up about the Azalea Festival. Like I said, I didn’t know anything about it! 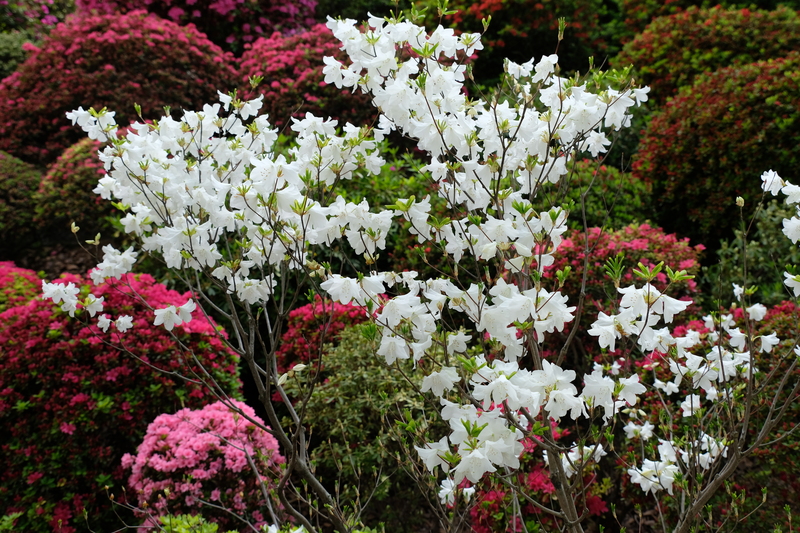 That aside, you don’t need to be a horticulturalist to appreciate the beauty and colour on display. Comparative to puffy clouds of green, red, pink, orange, purple and a sparing dash of white. This river of colour, running through undulating gently rapids, large trees on its banks casting scattered shadows. Bright vermilion torri dulled by the florescent colours emanating from millions of flowers. From a distance the colour a solid blanket, like one massive flower ball – up close, thousands of dainty petals packed tightly together. If your parachute didn’t open this is where you would wish to land, on a mattress made of flowers. Just looking at it made me want to “bush-dive” onto them, it looked so soft and inviting…obviously I didn’t, nor am I advocating doing so 😊! Considering Tokyo is one of the most densely populated cities, though not equally polluted nor dirty. 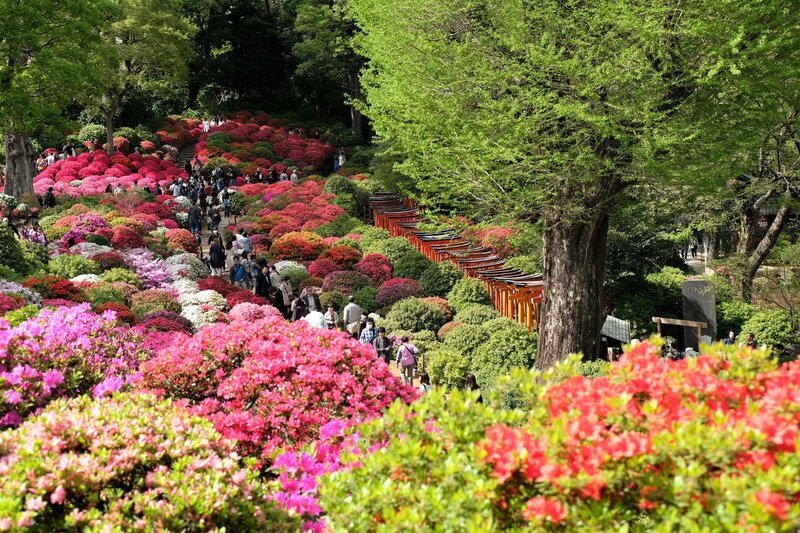 Nezu Shrine with its garden, is without doubt a sanctuary – a sanctuary of colour, flowers, nature and bliss, even when filled with people. Coupled with me being mildly preoccupied about the hotel overcharge (it hadn’t been resolved), I left Nezu Shrine on cloud nine. Walking back to the metro with effervescent floral bouquets still fresh in my nostrils and vivid in my mind. ….I hope my pictures do it justice! Moving on, I made my way to Shibuya to see the famous Shibuya Crossing, arriving earlier than planned. I could have gone straight there then head back to the hotel. Instead, taking a look on Google Maps, Yoyogi Park was less than 100m away. Why the hell not kill time and go check it out. Yoyogi Park combined with the grounds of Meiji Shrine may as well be the same thing. 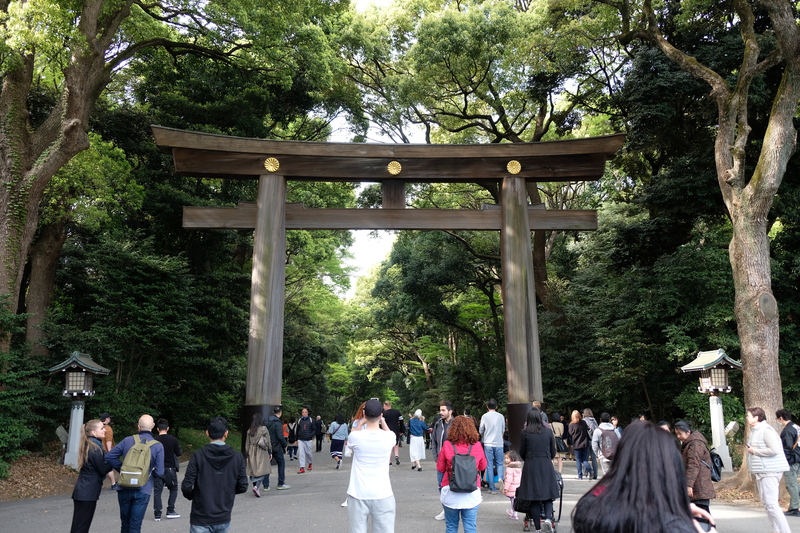 Though large parts are, some of Meiji Shrine has separate paid entrances and fenced off. Entering Yoyogi Park from Harajuku station is the largest wooden torri I’d seen (possibly the largest wooden one I’d see throughout my whole time in Japan). Expecting small park paths after the torri, I couldn’t have been more wrong. I use the word “path” loosely, I’ve seen narrower motorways! A gravel path/road, 6 cars wide easily, leading to the Meiji Shrine. Stereotypical to Japanese custom, the walk along the road was quiet despite the train of people in both directions. A gentle crunching sound filled the air with a subtle hum coming from the grinding of gravel under foot. Additionally, one thing stood out to me as I walked, the Japanese people don’t like to make eye contact at all. They don’t just dim their eyes downwards, no, they dip their whole head. In Japan this is a sign of politeness, in many other cultures it would perceived as negative. During my short visit I found Japanese people to be very reserved and respectful, this can be misconstrued as being aloof. However, when you do get to speak to anyone (hotel, train station, shop etc.) they are exceptionally friendly and willing to help – even if you ask a stranger on the street. Almost forgot to tell you about the sake barrels! These barrels add a colourful display and uniformity against the backdrop of the evergreen forest. 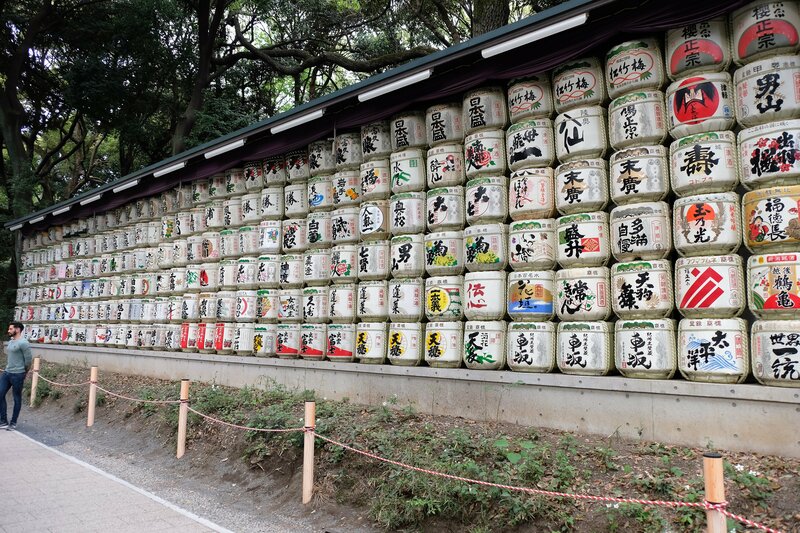 It goes without saying, the sake barrels are not solely there to attract tourists, Japanese don’t do things that way. Uniquely sake and Shinto shrines have had an intrinsic relationship for hundreds of years. Called (the sake barrels) kazaridaru when displayed near a Shinto shrine they are decorative barrels, and empty…imagine if they weren’t! 😊). Considering the ancient Japanese word for “sake” is “miki”, which in turn is a combination of the word’s “god” and “wine”. It explains why sake is seen and used as a conduit between the gods and people. 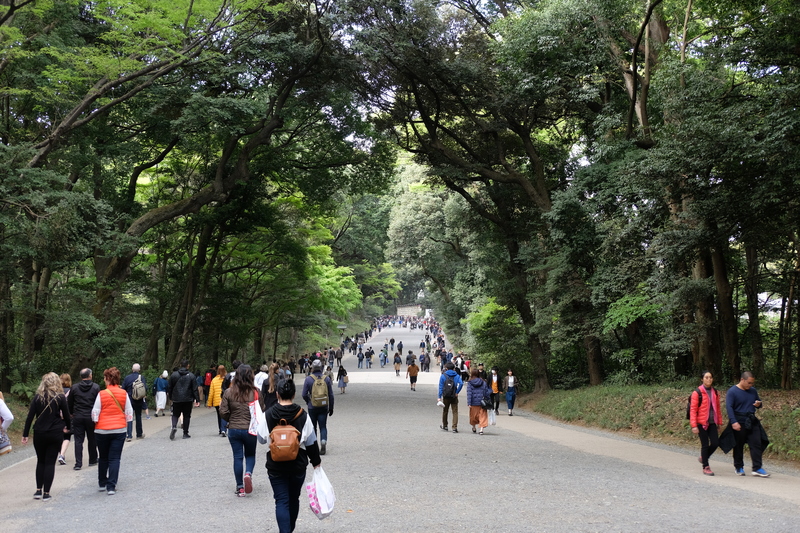 A forest surrounds Yoyogi Park and the Meiji Shrine, the latter grounds alone are 70 hectares. 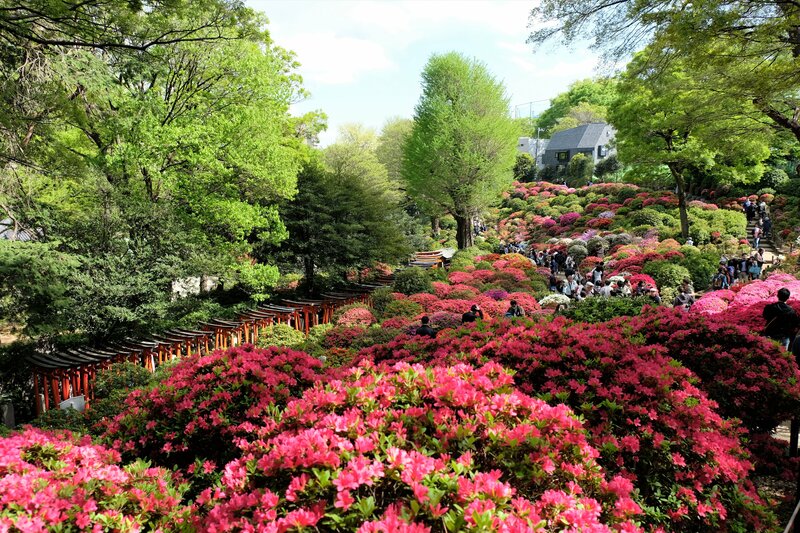 In fact, the park is the most visited park in Tokyo. 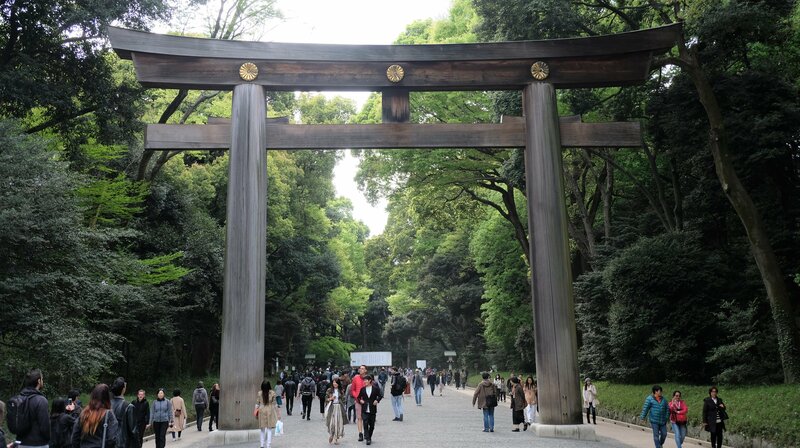 I’ll explain shortly, why the Meiji Shrine has great significance to the Japanese. 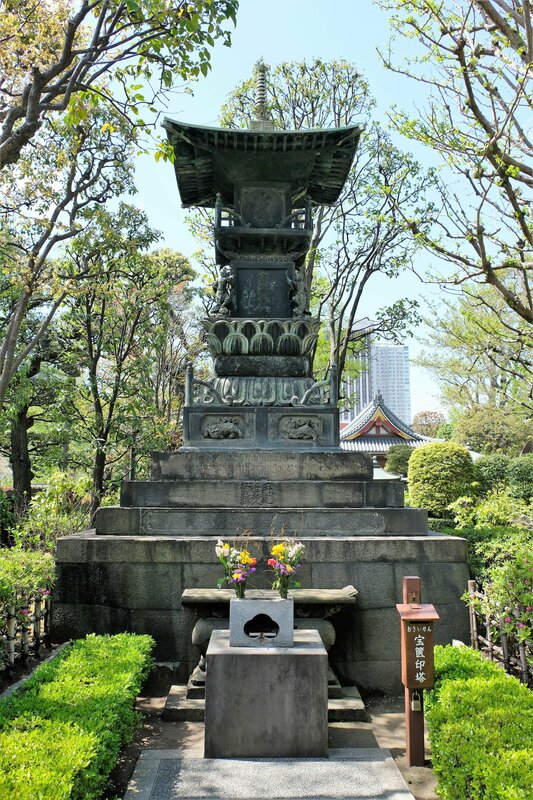 For Edokko (meaning “people of Edo”, the term commonly used for people from Tokyo), it is the most visited shrine for hatsumōde; meaning the first Shinto shrine visited for the Japanese New Year. 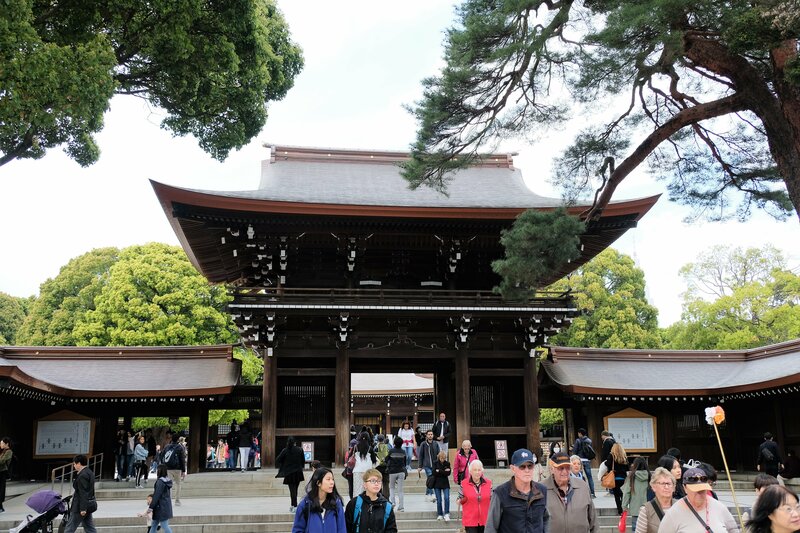 Meiji Shrine is in honour of Emperor Meiji and his wife, Empress Shōken, both are deified. However, it is not their burial site, that is just South of Kyoto. Emperor Meiji played a large role in the Meiji Restoration (Part 1) this is in large part the reason for his veneration. After the Emperor’s death in 1912 construction started, taking 6 years to completed (1915-1921). It’s gardens however took an additional 5 years, finishing in 1926. During WWII Tokyo was heavily bombed destroying much of the city and the shrine. The shrines’ rebuild was finance through public funding and concluded in October 1958. Unsurprisingly, the shrine was busy when I got there. 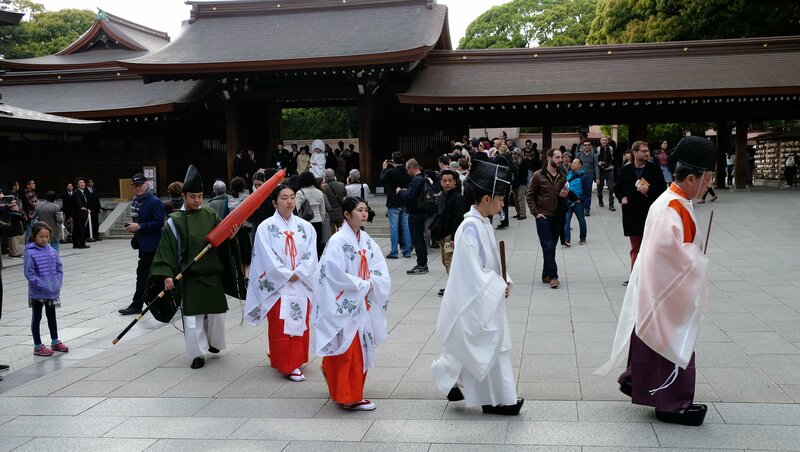 Owing to a traditional wedding taking place, access to most of the shrine was closed to the public. The bride and groom must either be wealthy or have high social status, that is my guess. Personally, I think your average Joe could arrange nor afford a wedding at such a venerated shrine, maybe I’m wrong. My rationale for this, not everyone can get married at St. Pauls, Westminster Abbey etc. I’ve been to many weddings, this is by far the most sombre and austere. Whoever they are I wish them longevity and happiness. Back to my day, people seemed to be enjoying the weather and parks, the whole area a hive of activity. Everything from ball games, picnics to musicians busking on the pavements, everywhere had a jovial atmosphere. During my walk I came across a unique street performance of Japanese rockabillies between Harajuka Station to Shibuya station. Rockabillies clad in denim, hair gelled back with high quiffs and wearing cowboy boots they danced to classic Rock ‘n Roll. Notably their boots a testament to how much dancing they do; soles worn through, held together by layers of duct tape. These rockabillies seemed so out of place in Tokyo, yet somehow fitting. 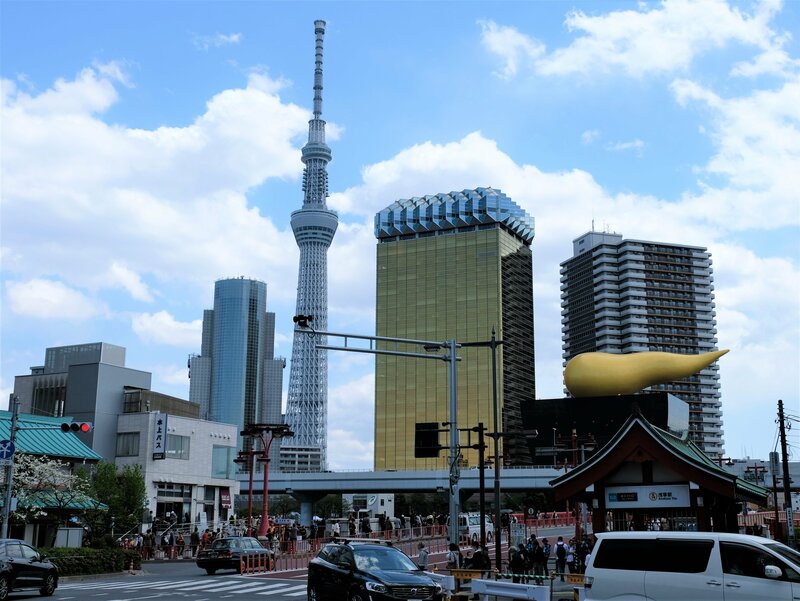 Central Shibuya mixes Akihabara and your bog standard shopping district, with distinctive Japanese flavour. 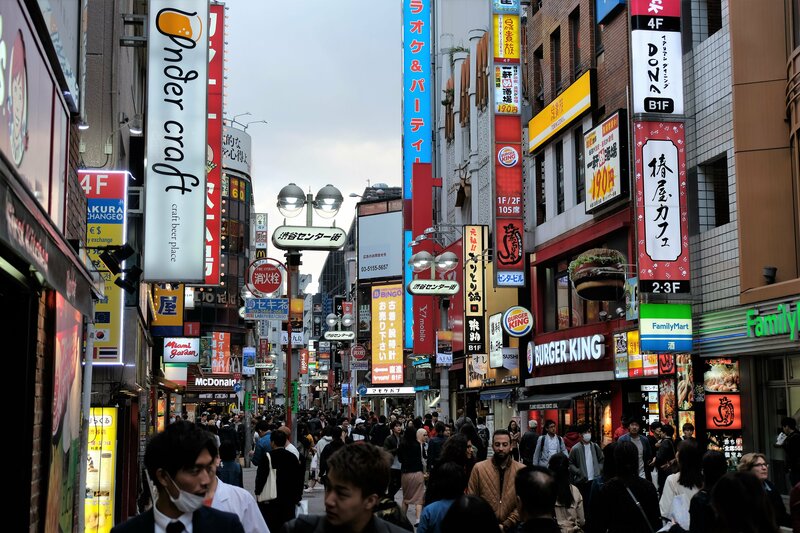 Including a few anime and manga places, but Shibuya isn’t known for that. Strolling around is interesting, even with may Western brands dotted about its unmistakably Japanese. I like Japanese signage, though I can’t explain exactly why. It’s bright, bold with lots of colours and there is so much of it. Creating a shockwave of light with no uniformity in size and positioned perpendicular to the buildings. Looking down the roads it’s a kaleidoscope of colour and light, adding to the vivacious energy of Shibuya’s bustling streets. It’s not often you can say going to a traffic intersection is your list of things to see, or a tourist hotspot! Shibuya Crossing is just that, a large intersection next to Shibuya train station and it’s a tourist hotspot! Added to the fact it’s not the biggest intersection I’ve ever seen, not by a long shot. Shibuya Crossing is somewhat a metaphor for Tokyo and the Japanese; discipline on a mass scale. The place was packed when I got there. Some videos themselves joining the crowds whilst crossing the road, others climbing up lampposts to get a better vantage point. Starbucks offers one of the best views…with a long queue “buying coffee” to get a window seat to watch and watch people crossing the street – in an orderly and Japanese way. I had no such luck in the Starbucks, nor was I willing to wait in the queue. Instead, I found an OK spot inside Shibuya station. Not the best of views, but away from the rugby scrum down below. Whatever your fancy, this is an oddity of a tourist spot. Only spending about 25 minutes at Shibuya Crossing, most of it taking up looking for an elevated position. I was expecting more, actually, I don’t know what I was expecting…it is after all a traffic intersection. In all fairness I wasn’t there during peak time, you wouldn’t think so judging by the amount of people. Still, it was nice walking around Shibuya, with Shibuya Crossing simply part of the fabric of the area. Well, that was it for Tokyo. I was really beginning to enjoy Japan now, still no resolution on my hotels.com overcharge. Kyoto would be my next stop. Obviously, I’ll get into more details of why I chose Kyoto and how I got there etc. Now, writing this post in New Zealand while visiting my brother and sister-in-law again…that’s a whole new story in itself. Over the past month I’ve been out of kilter with my routine, totally off track with my writing too. That in turn has demotivated me a little, but now I’m beginning to feel near normal again. Putting some perspective on what’s yet to come; I haven’t even started on writing about my time in Sydney, New Zealand South island, Peru (some awesome archaeological sites), Bolivia (some of the most diverse and beautiful scenery), Bogota, New York, Switzerland, Munich, Italy and Greece…..LOADS more to come. I hope you enjoyed this final snippet of Tokyo and enjoy what’s yet to come. PS. I’ve tried a different approach/technique with my writing, you may or many not notice. I’d be grateful for any feedback. Thanks for reading.